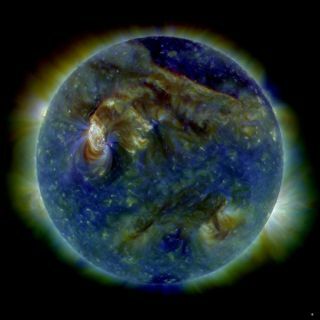 NASA's Solar Dynamics Observatory snapped this multi-wavelength extreme ultraviolet image of the sun, showing the Aug. 1 solar eruption that blasted charged particles toward Earth. The Class C3 solar flare triggered stunning aurora displays and geomagnetic storms on Earth that lasted about 12 hours. SAN FRANCISCO ? Violent explosions on the sun erupt on aphenomenal scale ? one that envelopes the entire star ? and are linked bymassive magnetic threads that stretch across hundreds of thousands of miles, anew study finds. Solar flares, coronal mass ejections and other dramaticsolar storms can go off all at once across virtually the entire sun, a teamof researchers announced today (Dec. 13). The discovery suggests scientistsshould expand their studies of space weather to go beyond looking just atisolated parts of the sun, as has been common in the past. This wider perspective could make forecasting space weathermore difficult initially, but it should improve accuracy over the long haul,researchers said. The researchers presented their findings during a pressconference here at the fall 2010 meeting of the American Geophysical Union. The research team analyzed a massive explosion that took placeon the sun on Aug. 1, 2010. An entire hemisphere of the sun erupted, sendingshock waves racing across the solar surface and gigantic clouds of hot gasbillowing into space. As a result, the scientists were able to see, study andconnect the various, widely separated explosions. Researchers have known fordecades that solarflares tend to bloom synchronously across vast distances. But theexistence of these so-called "sympathetic flares" had been deducedmainly from statistical arguments, researchers said, not actual observations ofthe events as they occurred. So the new data should open a new window into scientists'understanding of the sun, researchers said. "We're not seeing everything [from Earth],"co-author Karel Schrijver, of Lockheed Martin's Solar and Astrophysics Lab inPalo Alto, told reporters today. "We have to expand our view and look wellbeyond the region exploding." The scientists aren't sure exactly how the explosive eventsare connected, and what the underlying triggers may be. That's one of the nextsteps in the research, they said. Solar flares and coronal mass ejections (CMEs) ? similarevents that throw off powerful plumes of energy and charged particles ? can interferewith radio and GPS signals on Earth. The events can affect airliners'communications with the ground, as well as a variety of other technologicalapplications. So getting a better handle on where and why these explosiveevents occur on the sun is key, researchers said. The new information shouldhelp out in this regard. "These new discoveries help us understand themechanisms of how and why solar flares and CMEs erupt from the sun, which inturn will improve our ability to predict these eruptive events," saidRodney Viereck, a scientist at the National Oceanic and AtmosphericAdministration's Space Weather Prediction Center in Boulder, Colo.
To really improve their predictions, Viereck said,forecasters will have to incorporate physics-based models based on ourimproving understanding of the sun. And this may take some time. Viereck compared space-weatherforecasters' situation today to that faced 50 years ago by meteorologistsseeking to understand Earth's weather. Back then, meteorologists were justbeginning to introduce physics-based models into their calculations. However long it takes, updating our understanding of the sun'sviolent tendencies is key, since the Earth orbits so close to its unpredictableparent star, researchers said. "We live in the outer atmosphere of our star,"said Lika Guhathakurta, SDO program scientist at NASA Headquarters inWashington, D.C. Getting a better understanding of space weather "isreally necessary. It's not a choice for spacefaring nations like ours."